In my book ASHES OF THE UNSPEAKABLE, a lightstick saves the day in a creative manner. They are useful prepper gear for the Bug Out Bag, the Get Home Bag, or even for your vehicle. As I write this, I am thinking of a story I heard on the news this morning. Snow caused a twelve-hour, thirty-five mile long backup on a Kentucky interstate yesterday. If you’re stuck on the highway for twelve hours, especially with kids, a light in the car can make a lot of difference. Running the engine for twelve hours eats up a lot of fuel. Most flashlights aren’t going to run twelve hours, either. 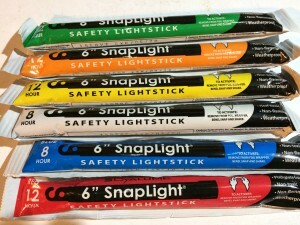 A twelve-hour lightstick in your car kit could be helpful. All of these are scenarios where you can put chemical lightsticks to use. They come in a variety of colors. You can get white or yellow for providing good, usable light. You can get red for preserving your night vision. You can even get infrared IR lightsticks that produce light that is only visible to folks wearing nightvision. This system is frequently used by military forces to distinguish the good guys from the bad in darkness. The IR stick produces no visible light, but glows when viewed by a NVD. Lightsticks are cheap, they don’t take up much room, and they don’t weigh much. I’d encourage you to get a couple for your various gear bags. You can buy them on Amazon in bulk to save money and find better variety.